Bananas are healthy and tasty fruits many people consume on a daily basis. Some even like to grow their own bananas in their gardens, provided that the climate and other conditions are favorable. Bananas can be used in many different ways: they can be eaten raw or used to make smoothies, pies, fruit salads and many other tasty meals. One common problem with bananas is that sometimes you don’t harvest them or buy them when they are ready. Green bananas are not ripe so it’s usually best to wait for a while and allow them to mature once they are harvested. 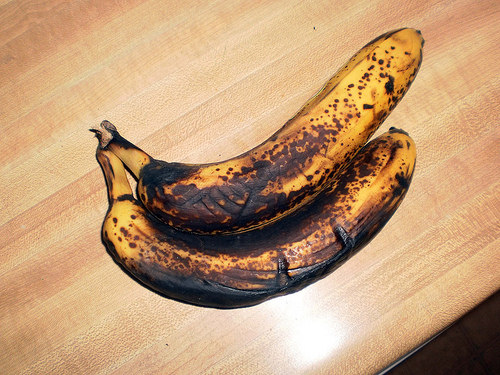 This may pose a different problem: bananas that are left to mature for too long may become over-ripe. There may be many situations in which you may end up with over-ripe bananas, so don’t worry: it happens to everyone. Over-ripe bananas are not tasty and many people decide to throw them away. However, you don’t have to do it. Believe it or not, there are some pretty great uses of over-ripe bananas you may try. This way, you will never have to throw away another banana just because it’s over-ripe. Freeze the bananas. You can easily freeze your over-ripe bananas so you can use them later in the place of ice in a smoothie. Once frozen, an over-ripe banana will taste just as good as the regular one when you blend it to make a smoothie. Simply replace the ice in the recipe with your frozen bananas. You may do this even with bananas that are not over-ripe, but it’s a great idea on how to save all of your over-ripe bananas. Make a puree for your rose bushes. You might not know this, but roses simply adore some banana puree. To make this tea, puree an over-ripe banana with a little water. Place the puree around the base of the plant. You may even bury it a bit in the ground around the base of the rose. Your roses will grow bigger and healthier and they will produce bigger blooms. Make a puree or tea for your house plants. Roses are not the only plants that can benefit from some great banana puree or a tea. You may use over-ripe bananas to make a puree for your home plants. Or you may add a bit of banana to water to make a nice banana tea for your plants. Make a banana sugar scrub. Bananas, even the over-ripe ones, are very healthy for the skin. You may use an over-ripe banana to make a quick facial scrub. Simply scrub the banana over your face, making sure to avoid the eye area. Leave it for a bit and then rinse it off. Alternatively, you may scrub the banana over your entire body before you get into the shower. This will make your skin super-soft and healthy. Finally, you may try some of the recipes that specifically ask for over-ripe bananas. The most popular one is banana bread, but there are many other ways to use over-ripe bananas. Just search for a tasty recipe you can use whenever you have over-ripe bananas in your home! By trying these tips you will always be able to find a use for your over-ripe bananas so you will never have to throw an over-ripe banana again.